Well, it's almost the end of 2012 which was a busy year here at Vanishing Montreal. I've compiled a lot of stuff (and still have loads more from 2012 to upload) which was fascinating and heartbreaking and sometimes even uplifting. Things might change a lot though for the blog as Google has recently updated their Google Maps and Streetview with new images captured back in April 2012. This will make my job that much harder to figure out changes going on here in Montreal. 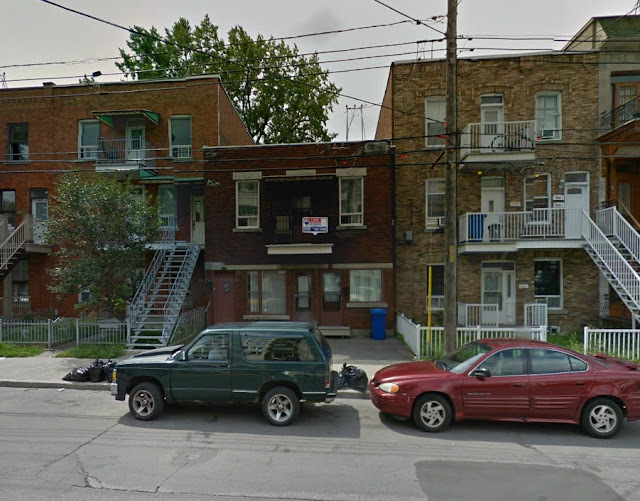 I started this blog in 2009 and by chance Google Maps captured most of Montreal in 2009 and the condo boom, which has really exploded during the past 3 years, all helped me in creating this blog. It was perfect synchronicity. One of the reasons why I decided to do the blog was because I had taken tons of photos of the city for the past 10 years prior to 2009 but as things went on that year I noticed that several spots which had laid dormant and decaying for decades were quickly being replaced with condo projects which prompted me to create this blog in order to catalog all of these major changes going in our urban landscape. It's technically impossible for me to know which building is set to be demolished (unless there's a big sign stating so) and to photograph all of Montreal. This is where Google Maps became vital for the blog. It was easy to see a new construction going on somewhere and then just checking out how it looked like back in 2009 with Google Maps but with the new 2011/2012 updates, it's gonna be hard to continue doing the same thing I've been doing for the past 3+ years. I've checked many areas, mostly in Saint-Henri, just to see how extensive the updates are and there's still a few places with images from 2009 but most of it was captured in 2011 and April 2012. This means that I can only really monitor any new changes starting from 2011 or from this year and knowing how extensive the condo boom has been going on in the city, it's going to be almost impossible to keep up or figure out what's going on or to do "Before & After" anymore. So the blog's future is sorta in the air. I'm going to spend some time trying to figure out a work around or maybe make some changes to the way the blog is designed but from now on the blog's updates will decidedly slow down considerably. I'm not stopping the blog but the updates probably won't be as frequent as they used to be. Anyway, thanks for all the supporters and those who provided me with photos or tips. I won't be updating the blog until next year so until then happy holidays, merry Christmas, joyeux Noel, happy Hanukkah and have a happy new year. 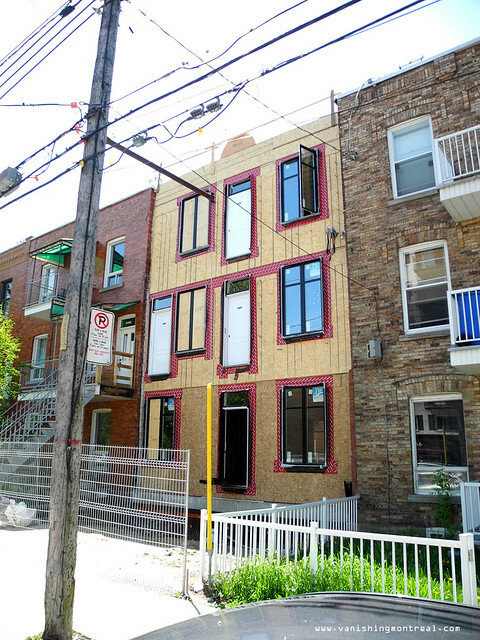 This small duplex was demolished on Wellington street in Verdun for a new triplex project. The photo below was taken last summer. I haven't been there since to see if the construction has now been completed. Sorry I haven't contributed in a while but I'll be sending some stuff your way early in the new year if I can! About your Google Street View woes, I know that when using Google Earth there is a way to view (aerial) map data from previous years, so if you're lucky Google will let you "go back in time" with Google Street View when they start updating their data on the servers. I once read that Google had Google Street View data going back to the 90's (!! ), though I'm not sure which regions he was referring to that went back that far (probably California for sure). Hey, it's been a long time. Nice to hear from you. It would be great to go back in time with Google Streetview. The satellite images still show Montreal from several years back but with Google Streetview it's different. For example I was looking a few areas in Verdun via the updated Google Streetview, areas which I haven't been to in a while, and I discovered a new construction going on I wasn't aware of. It's a big construction. Because I've discovered this with the updated Streeview so I'll never know what was there before. Best wishes to you, John, and thank you for an informative blog. Although I'm long gone from the city, your blog keeps me up-to-date.